I left Pueblo, Colorado in 1980, inspired to serve my country and give back. I had no idea how much my life would change once I decided to attend the fifth class of women at the United States Air Force Academy (USAFA). I stepped into a world unlike any I had known before, and this one decision changed my world forever. The Academy i ntroduced me to things I had never dreamed and opened my mind to all possibilities. Early on, the Air Force invested in my potential and challenged me to grow personally and academically. At the time, I’m not sure I viewed these challenges as opportunities, I viewed them as a struggle—how wrong I was. At USAFA everyone graduates with a Bachelor of Science and the expectations are high. A cadet takes electrical, aerospace, astronautical engineering, along with chemistry, physics, computer science classes throughout the four years and some classes were tough! There was no easy path to get through the Academy…you had to hit the books night after night and hard work was the standard to pass these classes. In one of my classes we had to build a bridge with toothpicks that could hold weight. Building that bridge sparked a creative element and made me realize anything is possible. Even though just a “toothpick” bridge, it inspired me to pursue civil engineering. Something so simple, as building a model bridge was the fuel for my curiosity to study engineering. In the class of 1984, there were only two females in the civil engineering program, I was one of two. The head of the department engaged us early reinforcing “you will graduate”. Our professor understood the importance of diversity and knew what we were up against. He ensured our success to graduate as civil engineers. Our professor did not give a pass by any means, no handouts, or shortcuts. We had to do the hard work, but he offered something much more—being a mentor. I didn’t understand it at the time, but he was someone who encouraged us, kept our faith alive, and pointed us in the right direction when we struggled. By graduating in 1984 with a Bachelor of Science in Civil Engineering, I learned I could be anything I wanted, with hard work and a dedicated drive. The mentoring I received should be the norm for future STEM students, not the exception. I was lucky to have an amazing professor who cared about my success. Our youth needs to see people like themselves represented. It can’t just be a bumper sticker, they have to feel it in their heart and see it with their own eyes. I challenge all educators, parents, and, leaders to mentor our young and help them along their journey. We need to teach our youth hard work and dedication, even if the road gets rocky they need to be resilient enough to press through. I serve to protect our nation, but also stand as an example to our youth. I want our next generation to see leaders that they can identify with. I want them to know there are no barriers or limits to their potential. Every child has potential and we need to encourage them to be successful. For example, if I had never built that “toothpick” bridge I’m not sure I would have wanted to be a civil engineer. Reflecting on my 30 plus years of service, my greatest achievement has been the honor to serve our nation. I’ve advanced in the Air Force not because I’m Hispanic or a woman, but because of the opportunities the Air Force has afforded me. My work ethic and performance has been my grade card. 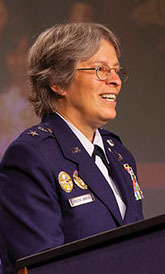 The Air Force has evaluated and rewarded the work I’ve performed, not my ethnicity or gender. I learned the Air Force believed in me and was interested in my potential. I want us to be invested in our children’s future. 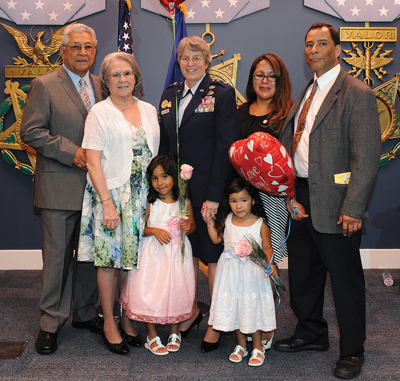 Who I’ve become today is intertwined with the Air Force, but my roots are with my Hispanic family. My family has always been my biggest champion. My parents taught me values that I hope every child would be so blessed to receive. I come from humble beginnings; my father was a janitor that worked his way to retire as a General Manager. He was loyal to his work and I saw firsthand what dedication looked like. My mother was a stay at home mom. Growing up I knew my mother was the most intelligent person in the world; she knew everything, and always knew what to do. She inspired me by always believing in me. Even when I told her I wanted to be President of the United States, she excitedly said “you can be whatever you want.” She believed I could be whatever this great nation had to offer and I did just that. I believe Mom had it right…from their dreams, the generation of tomorrow will build their destiny. God Bless the United States of America and thank you for letting me serve this great nation.